It seems I can’t go a week without hearing someone say that “sitting is the new smoking.” And I have one of those rather terrible city commutes – often over an hour each way – that is a lot of time sitting. So, I have been intrigued watching the furniture revolution happening in offices and in schools. I took the plunge last August and got a Varidesk. It is an adjustable desk that will rise so you can stand and work and lower so you can sit and work. And . . .. I wouldn’t go back. I never lower the desk. I did a little bit when I first got the desk but it was done more as a novelty. I leave it so I can stand and work. If I want to sit, I unplug my laptop and sit in a chair. I don’t stand all-day but I am definitely standing for the majority of time I am in my office. The standing desk has increased my productivity. I find I am far more focused and engaged when I am standing at my desk. I have always been someone who likes to move when I work, so I will work intently for several minutes and then stretch / walk and then get back to work. I have less back pain. In the post-40 year-old world of mine, like many I have developed a series of regular aches and pains. Standing has lessened my back pain and overall I have far less pain than from sitting for long periods of time. It did take a little getting used to the first couple weeks, standing all day, but it is now just my routine. Having a gel mat to stand on also really helped. I get more “steps”. This may mean very little to many of you but I am very conscious about my daily step count that is linked to my FitBit. Just by working standing-up I will get a couple hundred steps an hour – rather than the zero I get sitting. I still have to do a better job of being conscious about my posture. Especially in the afternoon I will lean on the desk when I work, and probably just replacing the problems of sitting with a different set of problems. I find the efforts around learning spaces in our schools to be fascinating. I love the variety of options we are giving students from bouncy chairs, to standing desks to quiet spots in the corner. I have visited a number of classrooms at both elementary and secondary that are creating a variety of desk options and also looking seriously at how they use space for learning. It is not just our schools that are looking at standing desks. Here is a recent story on the use of standing desks at New Westminster Secondary School and a CTV story on their use across North America. The changes in our classroom are clearly much more than just technology. 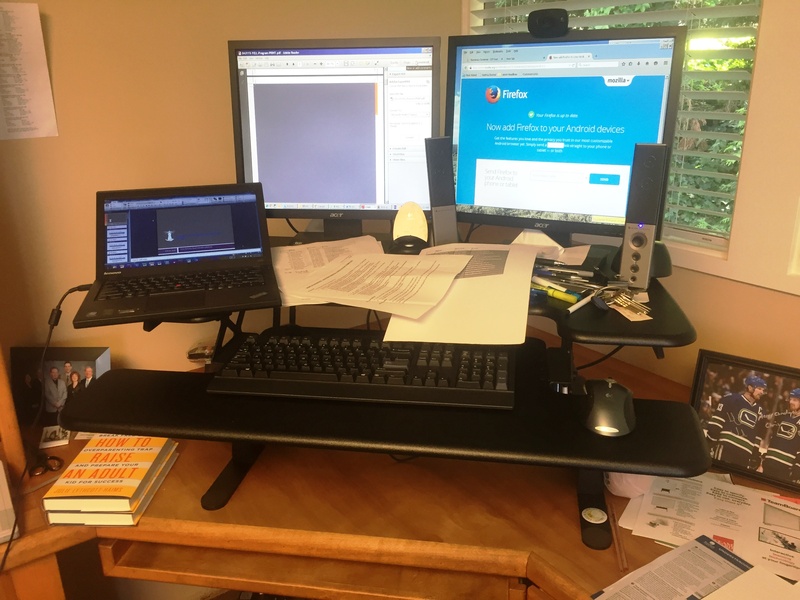 And admittedly as a sample size of one, I am finding the standing desk has really changed how I work – helping my health and making me more productive. I had the chance to speak with education students at the University of British Columbia earlier this week about the power of networks. I wrote earlier this year about my argument that being a networked teachers is one of the three key “must-do’s” for all new teachers. Being a networked teachers is about connecting face-to-face and digitally. 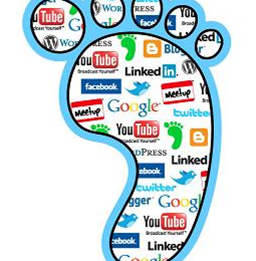 As part of the conversation on networking I spent some time talking about their educational digital footprint. For some very good reasons we have spent time in recent years telling teacher candidates about all the things they should not have as part of their digital footprint. We remind them to lock-down their privacy on Facebook, to remove the photos on Instagram holding a glass of wine, to take down the blog post they wrote about their wild trip to Europe and otherwise try to cleanse their digital presence. And we remind the soon-to-be teachers that everything they put on the web is part of who they are as a teacher. We also have serious conversations around boundaries with colleagues and students in the digital world. All of this is important. We spend a lot of time with teacher candidates and new teachers talking about what not to do. We also need to spend time talking about what those new to our profession should be doing to build up their educational digital footprint. I was in a session last week on young people and finances. The keynote speaker implored all young people to get a credit card to build up their good credit. I feel the same about all young teachers and their digital footprint – it is something they need to start building from the beginning. You don’t just “turn on” your educational digital presence, we are finding it takes years to build and refine. And what were some of the concrete things I suggested they do? 1) Get on Twitter. I know this is simplistic, but it is a first step to get in the game. 2) Start a blog. Get your own URL and start writing about teaching and learning. Over time it will likely morph as you grow in the profession. 3) Post your PowerPoint presentations to SlideShare. This is about participating in the community. When you create a presentation for an education class or your class at school with young students, post it and share it with the world. One of the beautiful things about the digital world, is many of our traditional hierarchies are blurred. We all can contribute and good ideas get traction. When I listen to a speaker, attend a presentation, or am introduced to someone who I “just have to meet” I almost always Google them afterwards. It usually confirms my thinking but sometimes it gives me some different perspectives. I know we don’t talk much about all the possibilities around your educational digital footprint, but we should. Then when I Google you, and I probably will, I will not only be struck by all the bad stuff I don’t see, but all the powerful professional learning and sharing I do see.